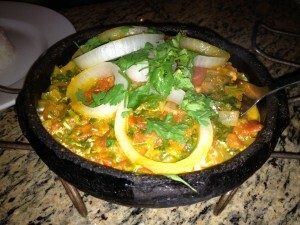 Muqueca is traditional Brazilian seafood stew with tomato, onion and cilantro, cooked in a special black clay pot. It is also a charming little restaurant on the outskirts of Inman Square. 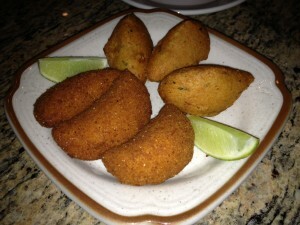 We started with an appetizer of Brazilian patties ($8). We had a choice of cod, shrimp or chicken and we opted for cod (3) and shrimp (3). The shrimp patties were good, but the cod was outstanding; they were crispy on the outside and smooth and creamy with briny cod flavor on the inside. You can’t go to a restaurant named Muqueca and not get the muqueca. We had the fish muqueca ($19) and a mariscada ($25), which is a similar stew but made with shellfish and coconut milk. They were both hearty and delicious, although both are better suited for a chilly winter night than the July heatwave we were in. The seafood was tender and I liked the richness the coconut milk added. It came with rice and plantains. 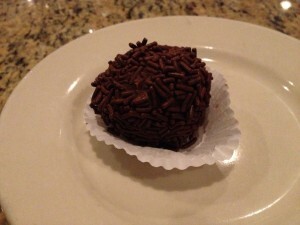 The portions are plentiful, so there was no need for dessert, but I spied brigadeiros on the menu and knew I had to try this classic Brazilian truffle. The interior is cooked condensed milk, butter and cocoa mixture and then the balls are rolled in chocolate sprinkles. It’s as sickly sweet as it sounds; I think this is one of those things people love because it’s associated with happy childhood memories, not because it’s that good. Our service was cheerful and the prices are reasonable. There is only on-street parking. The restaurant is a nice little neighborhood find.